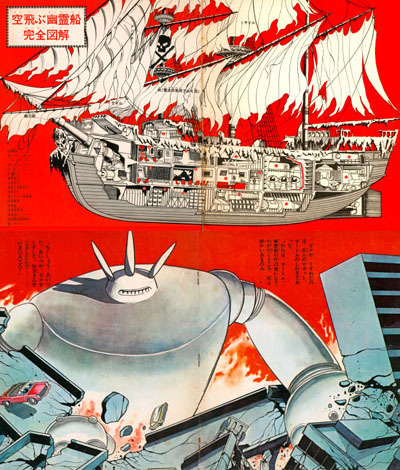 I’m a big fan of the 1969 Toei film FLYING PHANTOM SHIP – I paid cash money to have it translated into English, even though its story of a ultra-advanced flying battleship fighting super destructive giant robots controlled by an evil capitalist conspiracy masterminded by an undersea monster is easy enough to grasp, no matter what language it’s in. And as a big fan, I can’t quit writing about it. So when I spotted this Asahi Sonorama children’s book-and-record set among the Kamen Rider singles and jazz LPs of Tokyo’s Kanda/Jinbucho neighborhood, there was no question that it would be coming home with me. And it did! 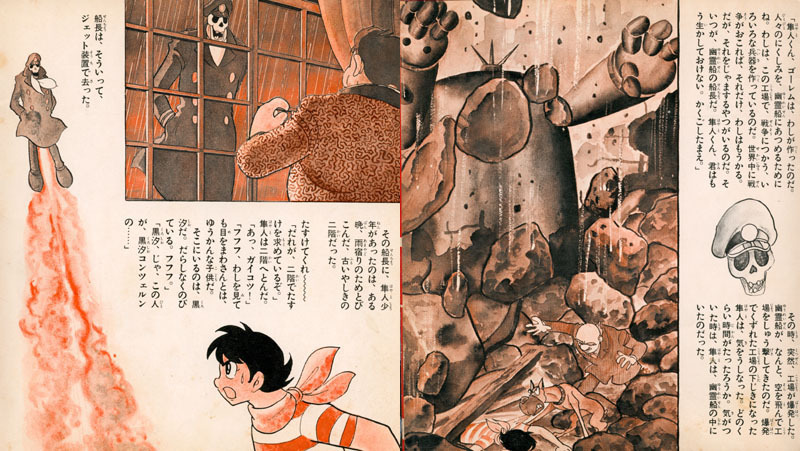 A highly abbreviated version of the film, what makes this scratchy Sonorama single stand out are the original Shotaro Ishinomori color illustrations. 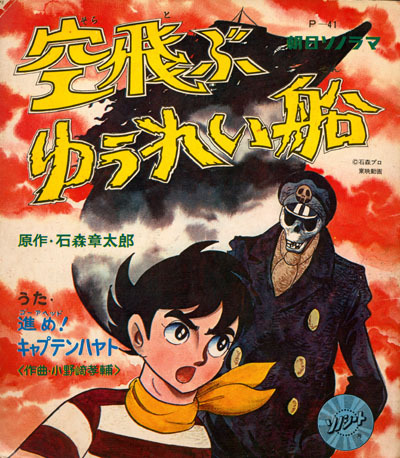 I can’t get enough of moody Ishinomori watercolors of tattered sailing vessels looming ominously in the background as Hayato, our audience-identification hero, bravely faces killer crabs and deadly soft drinks. Not that those make it onto this Sonorama record, of course. Hey, even at 331/3 rpm you only get seven minutes per side, so something’s gotta get cut. But the important stuff remains, including the mysterious skull-masked captain of the Flying Phantom Ship, the robot Golem, and its ending in a giant explosion (cue producer of “Bride Of The Monster”). The opening song and music cues from the film remain, though the dialog is completely rewritten. 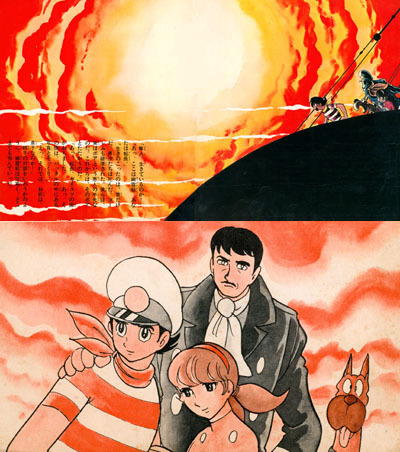 There are enough short Toei films from the late 1960s-early 1970s to outfit an entire fleet of Flying Phantom Ships, and while most of them can’t boast this movie’s pedigree, they’re all worth a look if you can dig ‘em up. Until that day, however, enjoy the scratches and pops of this representative sample. 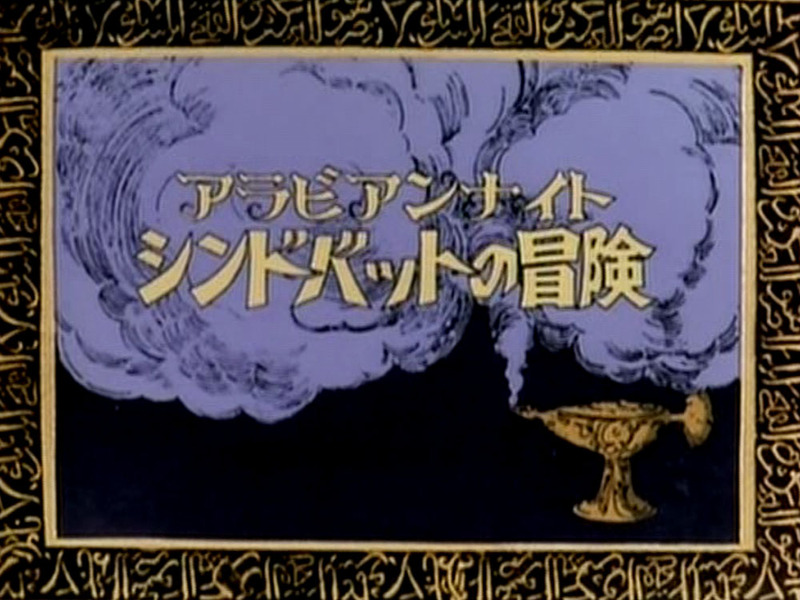 First broadcast in 1975, the Nippon Animation Company's SINDBAD THE SAILOR ("Adventures Of Sindbad") follows the adventures of the eponymous character Sindbad - here presented as slightly younger than in other versions - and his pals Aladdin the wizard, Ali "40 Thieves" Baba, and Yasmila the mynah bird as they voyage through the mysterious, magic-filled world of Arabian fairy tales. 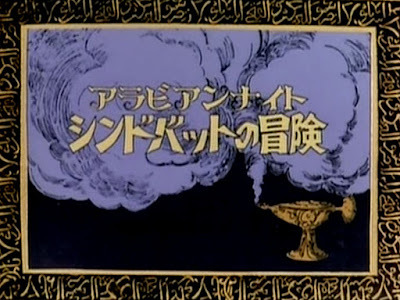 Broadcast in Japan, Spain, Poland, Italy, the Netherlands, France, China, and of course the Arabian Peninsula, SINDBAD became a worldwide hit beloved by children everywhere, except the United States. A shame, too, because the 52 episodes of SINDBAD are fun, full of action without being too violent and filled with exotic faraway places. We could have used a little SINDBAD in the dark days between "Speed Racer" and "Battle Of The Planets." 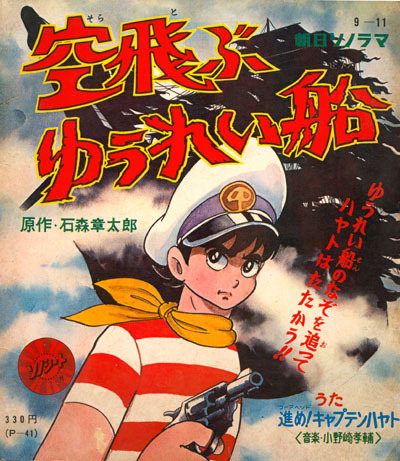 Directed by veteran Fumio Kurokawa, who also worked on Attack No. 1, Blinky The Koala, Around The World With Willy Fog, and that Jungle Book anime that was on TV here in the late 80s, SINDBAD boasted episode direction by several hands including that of Kunihiko Okazaki, who also gave us the grim pond life saga The Brave Frog. Instead of exciting adventure with Sindbad we had to endure "Scooby-Doo" reruns, the effects of whatever Sid & Marty Krofft were on that week, and drek like "Funky Phantom". 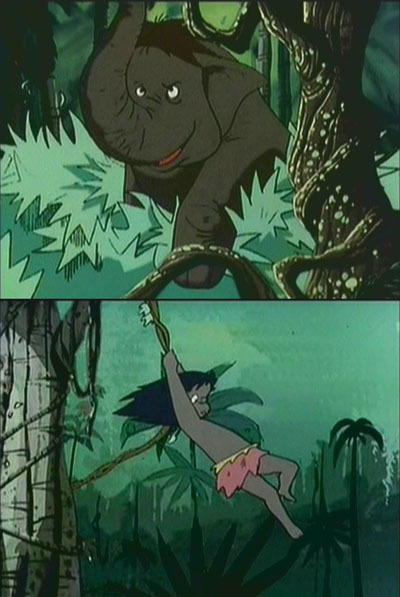 Did "Funky Phantom" ever go to the jungle to meet a jungle boy and Tusk the Cocoa Krispies mascot? Well, Sindbad did! Tusk is looking a little p.o. 'ed there. Those better not be Cocoa Pebbles in your bowl kids! 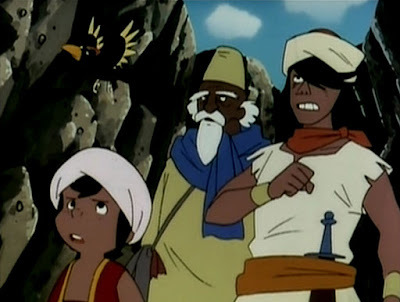 With a memorable theme song sung by Mitsuko Horie, colorful and chunky 70s style anime character designs, and animation work by veterans like Noboru Ishiguro, SINDBAD is a show that carved out its own little Arabic niche of anime history. 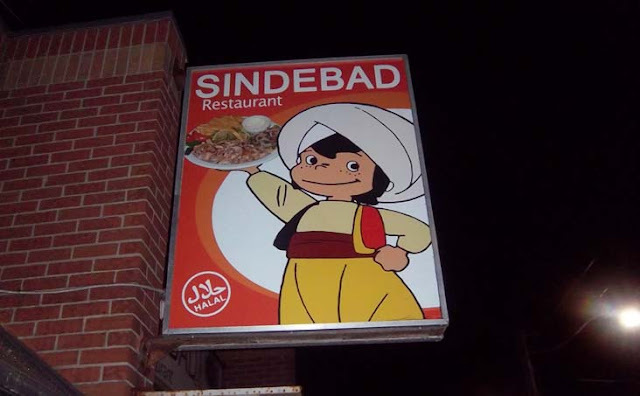 Sure, it would be neither the first nor the last Sindbad to appear in the medium of Japanese cartoons, but it's certainly the only one to be used as a restaurant mascot. Oh, you don't believe me? Witness photographic evidence of a "Sindbad" themed restaurant in, of all places, Canada's federal capital Ottawa! Cruising through Ottawa recently, I caught that sign out of the corner of my eye. I passed two intersections before I was able to convince myself I just saw a restaurant with "Sindbad" signage. And then I made an illegal U-turn. Always have your camera ready, kids! Sindbad might be coming your town - he made an appearance in Toronto recently! 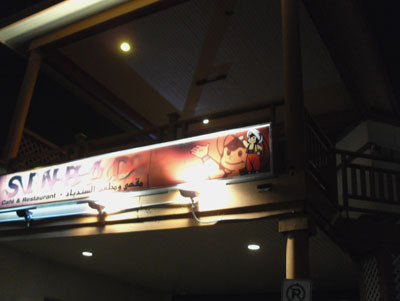 How many more Japanese cartoon characters are being used in an unauthorized fashion as restaurant mascots? Keep watching the roadsides, and look out for monsters, Sindbad!